Well, today is a pretty exciting day around here at Just Jingle! My blog has officially crossed over 150,000 visitors! I know some blogs do that in like a couple of months, but for me, it's pretty darned exciting! LOL! AND...worth a giveaway! So..be sure to read today's full post to get in on that fun!!! Let's start with a fun card using some Gourmet Rubber Stamp cuteness! For this card, I pulled out the Great Outdoors set. I LOVE the super cute images in this stamp set! Absolutely LOVE THEM! I was inspired by the CAS-Fridays challenge to cut the tree into strips and reassemble as a very tall, skinny tree! I love it! Super fun! I coated the tree with a bit of Smooch Glitz (Clearsnap) to give it a bit of sparkle and shine! I love that! 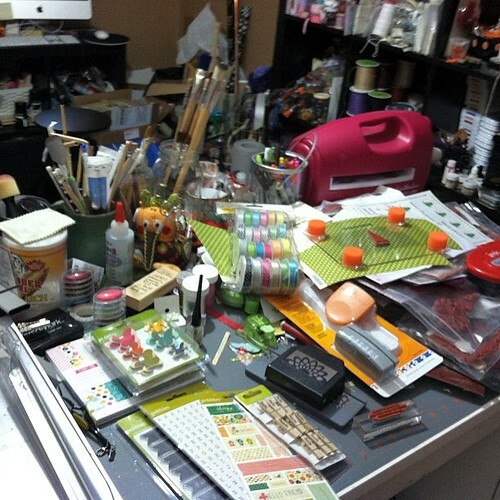 As for my workspace, WELLLLLLL....it just so happens that the prize box from the Paper Crafts Gallery Idol contest arrived yesterday!!!! YAY!!!! So...this isn't my desk, but rather, a corner of my living room floor, but I just HAD to share!!!! HOLY TONS OF SCRAPPY GOODNESS FUN BATMAN!!!!! HUGE thanks to Paper Crafts, each and every sponsor, AND, MOST OF ALL - all of YOU who voted for me along the way! I put some of the goodies away, but some landed on my desk...so that's a bit of a.... oh, who am I kidding? It would look like this anyway! HA! Don't forget to check out Julia's blog for more WOYWW goodness! Now...as for that GIVEAWAY! To celebrate the arrival of my Gallery Idol prize and my blog reaching 150,000 visits, I would like to offer TWO stamp sets to one winner! The first is the Poppy Bottles set from Stampendous! and the second is the Heartsong set from Skipping Stones Design. Enter using the form below. COMMENTS DO NOT COUNT AS ENTRIES - YOU MUST USE THE FORM. If you are in a reader, please click HERE to go through to the post. 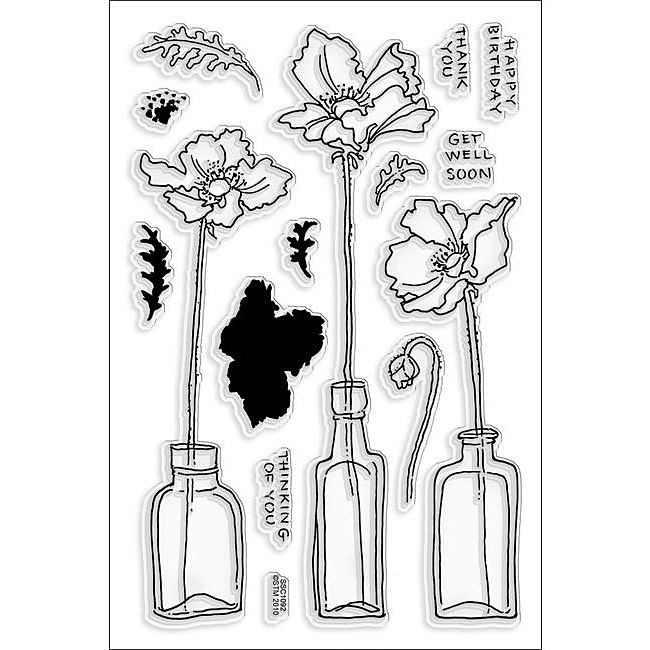 Here is the link to STAMPENDOUS! that you need to answer the first question! YAY! Love this awesome card dearie and congrats!!! Love love love the idea of the scallop punch to cut that tree and the glimmer of course! Sweet card creation, Jen! Firstly CONGRATULATIONS!! Woo hoo! Secondly, I love your card today, very cute! And thirdly, thanks for the chance to win!! 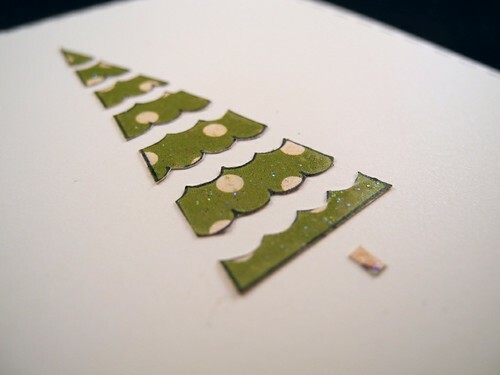 just love your card, love how you created a longer tree, very creative! congrats on your win, lovely goodies! Worth the wait, huh? Congrats on the huge milestone! Thanks for the chance to win! congrats on your visitors- wow that is a lot!! soo many fun goodies i can't wait to see what you create with it all! Sweeeeet! Thanks for the chance to win, and happy WOYWW! Such a cute card - and again, big CONGRATS on your Gallery Idol winnings!!! So exciting! WOW all I can say is that you ROCK! LOL....I have been MIA, took a scrappy BREAK for a few months........but Im bag and trying to get back into the SWING of the blog world...still love coming to your blog to see what you are up to! Congratulations, and wow is that some happy mail indeed! THanks so much for sharing your inspiration daily with all of us! Jenn, what an amazing achievement...150K views is awesome. Congrats on the WELL DESERVED fun goody hall from Gallery Idol. Love it! Haven't played with the washi yet! Looks cool! Thanks for a chance to win the SSD stamp that's been on my list foreva! What a great lot of prizes you won! I think I've entered your giveaway, "mmmmm complicated I have found it!" Great TREE card Jingle..What a STASH of GOODIES, You earned them! I love how you chopped up the tree and stretched it out. I love tall skinny things (maybe because I'm not either?). Your prize package from the Idol Gallery is fabulous! I wondered if you'd win anything for going so far in the contest and wowzah, you got major loot for it! How totally fun. Wow, you're desk is quite crammed full of wonderful things. Best get to playing now. Amazing card as always love your inspiration!!!!! What a great way to celebrate your achievements, lots of amazing crafting goodies, congrats and enjoy!!! 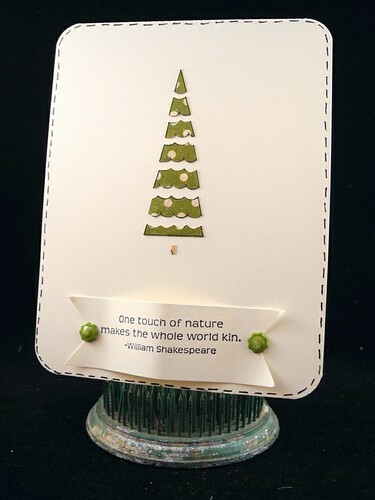 What a wonderful card...how ingenious to use the punch to make your tree into strips!! That quote is powerful...love it!! Thanks for sharing your creativity with us this week at CAS-ual Fridays:)!! 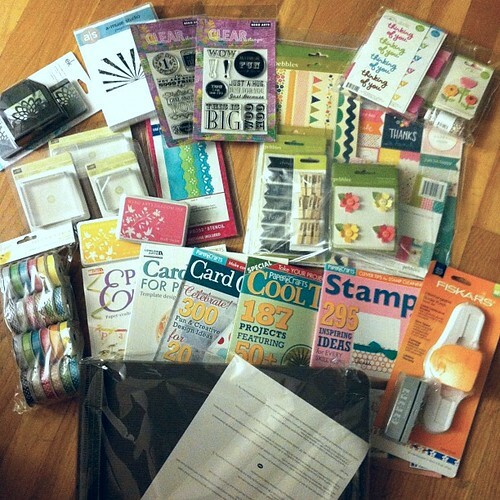 I always love your cards and projects and it's no wonder you have such a huge following! Congrats on your milestone....and thanks for the awesome giveaway!! 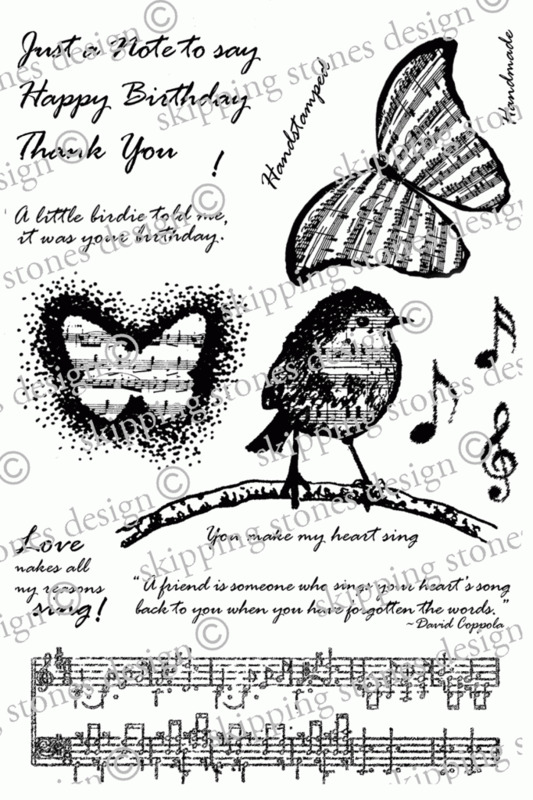 I am a HUGE stamp fanatic and I would love either one of those stamp sets! You are going to make some great stuff with all those goodies! Love, love, love, your stripey tree, Jennifer! I hope you enjoy your well deserved goodies, how fun! Your Gallery idol cards were just stunning, and I became a new follower of your blog after I saw them. Well done on your achievements, and I was sorry to see you didn't win. Thank you for sharing some of your prize. That's very generous. Huge fan, as you know!! How sweet are YOU, sharing your prizes!? Busy desk, lots of lovely stash! Congratulations on getting so many visitors! Once it starts to grow, it sort of snowballs, doesn't it! Very cute card...love how you think outside the box. What a fun card and a fabulous giveaway!! Thanks!